Shambhala Chicago partners with many organizations to advocate on behalf of Chicago’s youth. Some of our initiatives in this area include joining and working with Thrive and the Peace Hub, two groups who are made up of a variety of organizations including Chicago Public Schools (CPS), who both take close looks at what changes need to happen for Chicago’s youth to succeed, and work to make them happen. To further advocate for youth, Shambhala Chicago has been learning about restorative practices such as peace circles and are beginning to work with the closely with Chicago’s Restorative Justice community. We have partnered with Ceasefire and Circles and Ciphers to offer a semester long program at Orr High School that will couple mindfulness and peace circles to dialogue about issues that youth face. We first started to look deeply at restorative practices early in 2014. 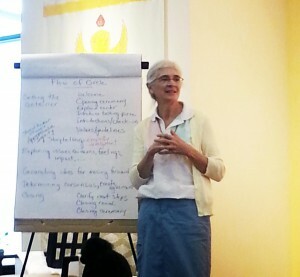 We first brought in Kay Pranis, a national leader in restorative justice to conduct a four day Peace Circle training. 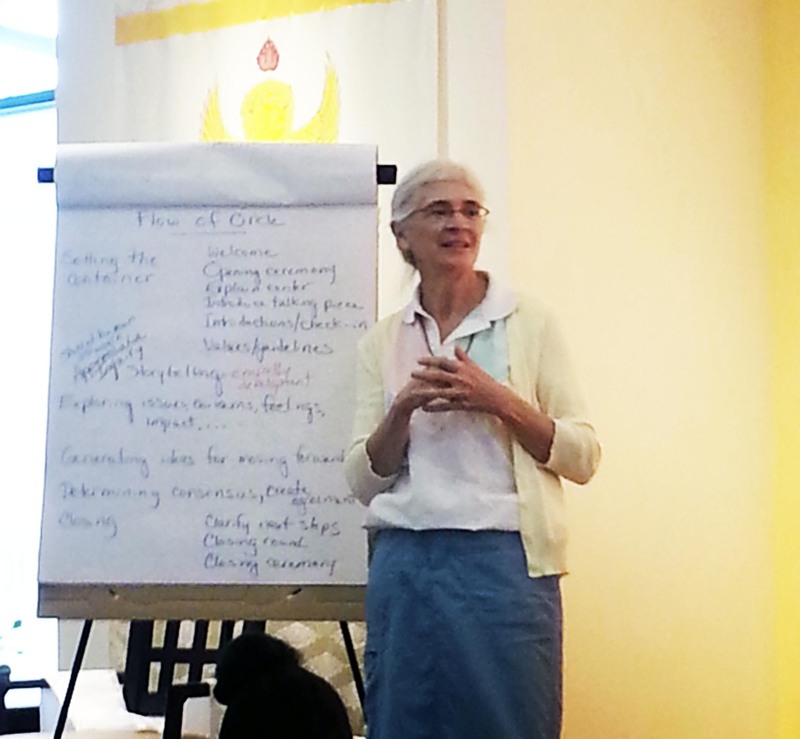 Most of the participants who attended were leaders in restorative practices and practioners and teachers of mindfulness both at Shambhala Chicago, Tergar, and The Padmasambhava Buddhist Group. Many of our mindfulness instructors are looking to see how mindfulness and work in conjunction with restorative practice. Shambhala Chicago has partnered with Mindful Schools in Oakland, California to train teachers in the Mindful Schools curriculum. We plan to use this curriculum to bring mindfulness into schools. We have developed a program for youth that combines peace circles and mindfulness and are piloting it this year at Orr Academy High School. The program uses Ceasefire’s existing curriculum at Orr and enhances the program by adding mindfulness and peace circles. We have also partnered with Circles and Ciphers, a leadership development program for young men who are prison, court, and gang involved, who will work with us on the initiative. If you’re school is interest in bringing mindfulness and restorative approaches, email us and let us know. We are still raising funds for this program. If you are interested in making a donation so we can continue bringing mindfulness to schools, click here. Please specify in the Comments area what your donation is for, by entering “Donate for Mindfulness Programs in Schools”. Through systems integration of county, city and local resources, the Peace Hub will create a coordinated network infrastructure which allows service providers to access, share and weave resources together to address each youth’s individual needs and circumstances. The Peace Hub seeks to reduce exposure to or participation in violence, address trauma and improve positive outcomes for youth by facilitating easy access to programs and services and by fostering consistent continuum of care through case management systems. Research indicates that it is critical to intervene with youth at this age because the potential to turn around inappropriate, delinquent, violent and/or aggressive behaviors is far likelier than it would be later in life, when youth are too deep into the criminal system, gang structures, and/or other negative influences. Shambhala Chicago became a member of the Peace Hub in 2013. At the Imagining Peace Conference, which we hosted in 2013, we put together a document called the PeacePlatform. The Peace Platform is a collection of 15 statements that the group that attended the conference felt were the most important changes needed to see youth violence in Chicago drop. The 15 statements were collected, and then enhanced by the 25 organizations that attended the Imagining Peace Conference. The finalized version of the Peace Platform was presented to the Mayor’s office and the Governor’s office. Currently, the Peace Hub has decided to take the Peace Platform and is deciding on its next steps. From time to time, new initiatives are launched out of a Mayor’s office, intending to get everyone involved, and pointing in the same direction, in efforts to help young people succeed in school. In Chicago a Thrive Chicago initiative, modeled after the STRIVE partnership in Cincinnati, has been growing. Thrive is a collective impact model to Chicago to create a true cradle to career continuum of services for young people. Currently, the school system, government agencies, non-profit and faith based institutions all serve young people with different missions – but without clear outcomes, and without consideration to the other available services. Representatives from all sectors are asking for more of a roadmap for how to strategically connect to a unified vision for education and youth. There has been strong momentum across the city around adopting this framework over the last year, and many neighborhood based initiatives and other collaborative efforts have already charted this path. Shambhala Chicago began working with Thrive in early 2014. Since then, we’ve become an active member of helping to create Thrive’s youth council, and working within thrive to look at issues impacting youth at the high school level. We’ve also brought other partner organizations into Thrive.